Asymptotic approximations to the zeros of Hermite and Laguerre polynomials are given, together with methods for obtaining the coefficients in the expansions. These approximations can be used as a standalone method of computation of Gaussian quadratures for high enough degrees, with Gaussian weights computed from asymptotic approximations for the orthogonal polynomials. We provide numerical evidence showing that for degrees greater than 100 the asymptotic methods are enough for a double precision accuracy computation (15-16 digits) of the nodes and weights of the Gauss--Hermite and Gauss--Laguerre quadratures. Gil, A, Segura, J, & Temme, N.M. (2017). 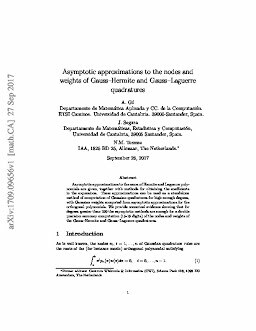 Asymptotic approximations to the nodes and weights of Gauss–Hermite and Gauss– Laguerre quadratures. arXiv.org e-Print archive.